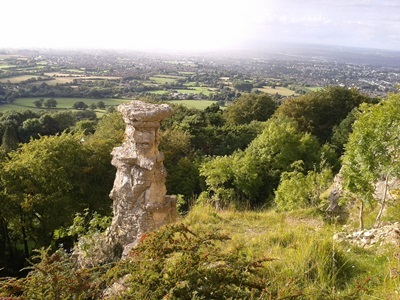 This truly uplifting walk reaches a crescendo at the mysterious Devils Chimney. No one really knows how this feature was made but there is no doubt it stands in a beautiful position looking out over the Severn Valley. A short walk but many view point opportunities. Park in Daisybank car park or just a few yards further in the Folk car park. (From the Daisybank car park walk right on the road until you reach the Folk car park). Opposite the Folk layby you will see a footpath sign and a metal style. Cross the style and head down the steps. At the bottom of the steps go straight on and then bear right towards a bench. Here you will see your first view towards the Malvern Hills, Cheltenham and the edge of the Cotswolds. Continue past the bench and turn left when you meet another footpath. You are now on the Gustav Holst Way. Head downhill along the path lined with trees and shrubs. After a few hundred yards there is a patch that gets muddy in wet weather. To avoid the mud climb the bank on the right and take the path on the left. Alternatively, go straight on in dry weather. Now descend diagonally across the field. Ahead, you will see views of Cleeve Hill in the distance. Continue down in to trees. The path eventually reaches the first buildings on the edge of Cheltenham. Turn right on the path at the rear of the first building and soon you will pass through a kissing gate and over a board walk. You will see views of Hartley Hill to your right. The next footpath sign points to the right and takes you in to a courtyard. Turn left here and head along the road towards some large Pine trees. Turn right following the footpath along Sandy Lane. Lilley Brook golf course will appear to your left. After a few hundred yards you will start to climb. This bit is hard work but is good excercise and you will be rewarded! Half way up the hill, pass through a gate and continue to climb. The path is quite uneven as hundreds of years of wear and tear have taken their toll. As the path levels, keep left and eventually you will be on a wide, flat and well made path. Views now open up to the left. You will eventually start climbing again. Pass through a gate and continue forward on the wide path until you see a Cotswold Way footpath sign on the left. Pass through the gate on the right and head uphill. The path splits here. Take either route, they will soon join. As you climb, tantalising views in the far distance appear for a moment. Continue through the next gate, climbing with a dry stone wall to your left. 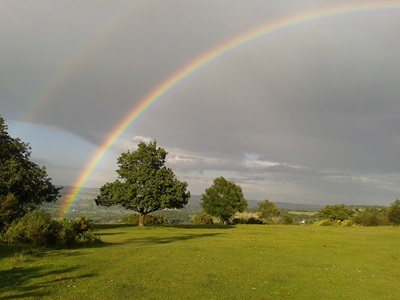 Shortly a drop appears on your right and fantastic views of Cheltenham, the Cotswold edge, Severn Valley and the Malverns (in the far distance) are to be seen. After passing a couple of benches (if you can resist the urge to sit and soak in the wonderful view) continue for about 1/4 mile until the path forks left (just after three benches on the left). Follow the left fork, pass through a gate and continue forward through the trees. Follow the "Cotswold Way" and "Crickley Hill Walks" marker posts. 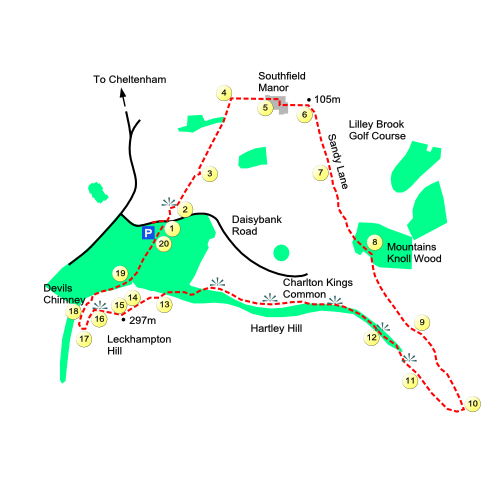 You are now on Leckhampton Hill. Look out for an information point on your left explaining about 2000 years of settlement. From here head towards the concrete triangulation post. Here you will be 293 meters (961 feet) above sea level. Keeping the trees and shrubs to your right head towards another post (similar to the triangulation point). When you get there you will find it is a topograph showing you what you can see from this vantage point. On a clear day you can see across to the Black Mountains in Wales. Turn left along the top of an old stone quarry. Do not stray too close to the edge. At a footpath sign turn right towards Devils Chimney. Soon you will see it below you on the left, proudly standing before a viewing area. No one really knows how this feature was made but there is no doubt it stands in a beautiful position looking out over the Severn Valley. When you are done here, continue along the path with views to the left and start your descent. Take your time here as this section is VERY steep and can be a little slippery. Stout shoes and walking poles are recommended. After a short while you will see the ruins of an old Victorian building that used to haul coaches up the steep tramway below. Continue forward following two ground level concrete footpath signs. The wide footpath dips along a ridge with steep wooded slopes on either side. Towards the bottom of the hill go straight on if you are parked in the Folk layby or left if you are parked in the Daisybank car park. It is a shame that this fine walk has to come to an end.